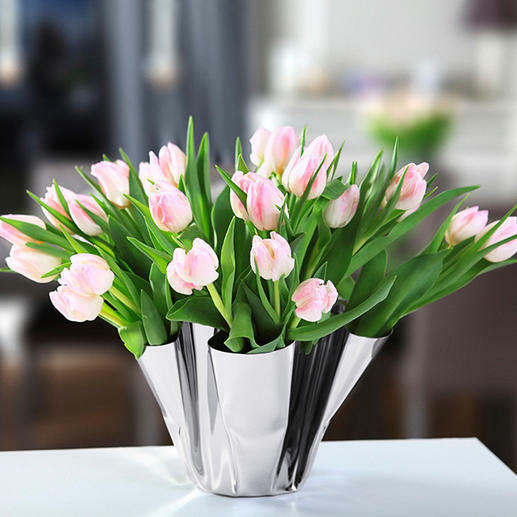 The indentation provide perfect positioning for blossoms. Elegant, even without floral decoration. 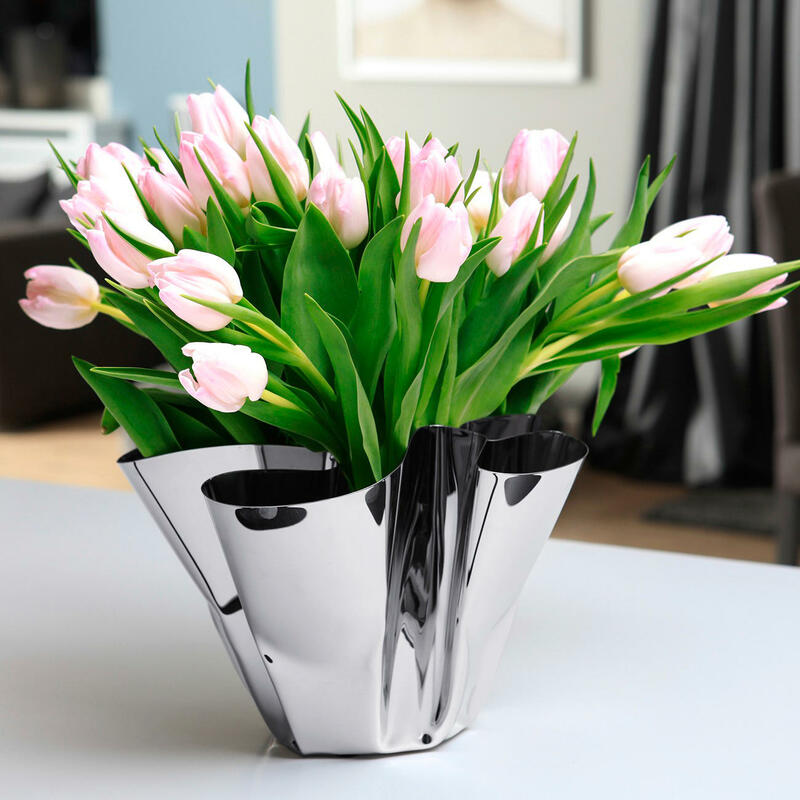 Splendidly elegant for flowers - and as a sophisticated object of design. 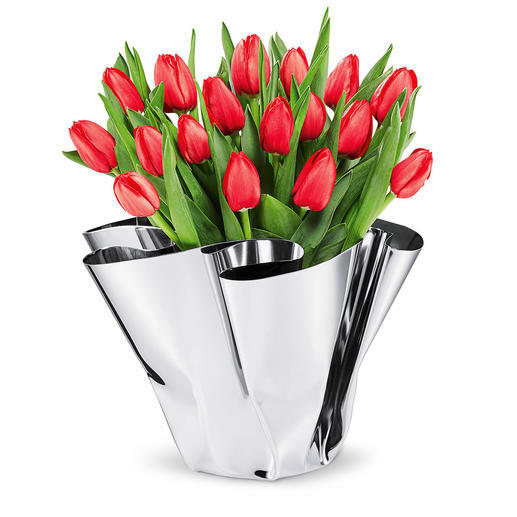 The mirror-polished stainless steel vase with hand-crafted draping. Always unique. The glossy stainless steel is elaborately worked into gently curved, generous folds - softly-flowing and lustrous like satin. A design that takes all that is rigid from the metal and lends it a new, supple elegance: Light and curved, with expressive interplay between reflection and shadows. 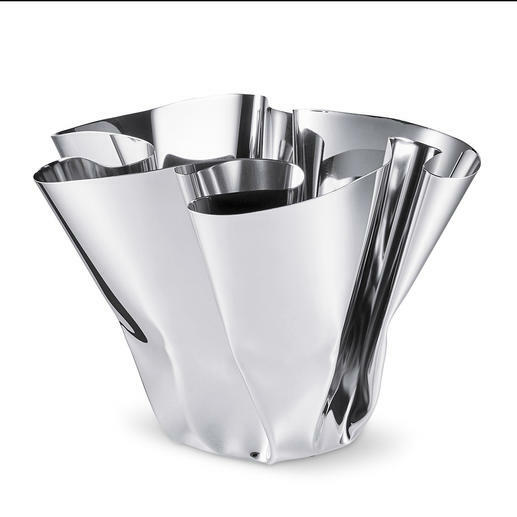 The starting material is a flat disc of highly polished stainless steel. With a specialised bending tool, practised hands push the disc up and at the same time give it that rippled soft draping shown. No two silhouettes are the same; each one is individual. Lush bouquets take on a pleasantly natural, effortless shape. Single, select flowers and branches become aesthetic blossom sculptures. The vase holds your arrangements perfectly in place and stages them elegantly - perfect throughout the year. More a sculpture than a vase. The design is an eye-catcher on its own - in the kitchen, living room, dining room and bedroom, as well as in your office. Measures 20cm (7.9") high, maximum 30cm (12") diameter. Weighs about 1.88kg (4.2 lbs). Mounted on furniture-friendly rubberised feet. Easy to clean with just a soft cloth. Design: Flip. By Philippi.